For More Inquiries, Call Us Today! It is our desire to help enhance the way of living of many individuals by providing them the right level of care that they need and deserve through the services we offer. With us, we give you nothing but quality assistance. One’s caloric needs decreases as they age while the need for nutrients stays the same or may increase. 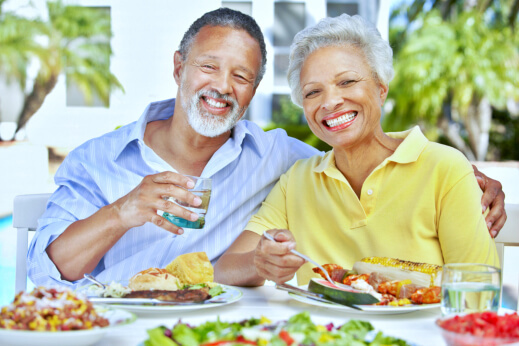 Seniors should eat more nutrient-rich foods such as vegetables and fruits, beans and lentils, as well as nuts and seeds to receive the vitamins, minerals, protein, carbohydrates, and fats they need. For a healthier digestive system and to avoid constipation or other problems, eating more fiber-rich food is necessary. Good sources of fiber include oats and oat bran, whole grains, and fruits and vegetables. When you are avoiding certain foods, you may find it hard to get some nutrients in your diet. You can ask your provider of medical service in Pennsylvania to assist you with what vitamin or mineral supplement you should take because some supplements may interfere with certain medications. As you age, it may be hard to recognize that you are thirsty. Make sure that you’re regularly drinking plenty of fluids. You should take at least 8 glasses of water daily. Other good sources of fluid aside from water are from juice, tea, soup, or water-rich fruits and vegetables. Eating with friends and family members, despite being on respite care, can be a good way to stay social. This kind of social interaction can turn mealtimes into a more enjoyable affair, instead of a chore that you would want to skip. As a provider of home care in Bala Cynwyd, Pennsylvania, we always make sure that seniors are following a healthy eating habit. We work with dietitians, nutritionists, and doctors to prepare the exact set of foods that seniors need. This entry was posted in Healthy Diet and tagged Health Care, healthy eating, stay hydrated, supplements. Bookmark the permalink. If you have further concerns and clarifications that you would like to share with us, please do not hesitate to keep in touch with us using the contact details below.